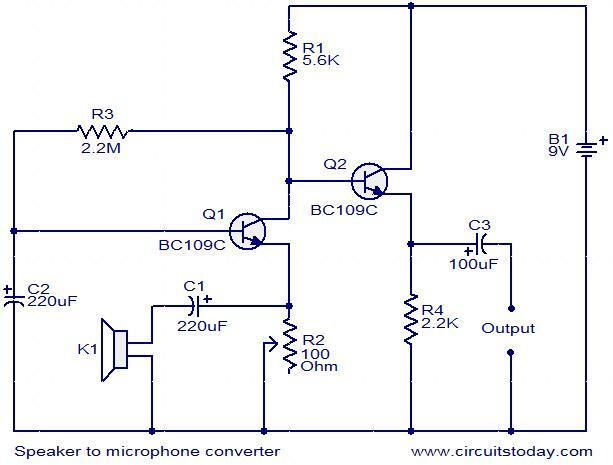 This circuit is a simple approach for converting a loud speaker into a microphone. When the sound waves fall on the diaphragm of a speaker, there will be fluctuations in the coil and there will be a small proportional induced voltage. Usually this induced voltage is very low in magnitude and useless. Here in the circuit the low voltage is amplified using transistors to produce a reasonable output. The transistor Q1 is wired in common base mode and produces the required voltage gain. The transistor Q2 is wired as an emitter follower to produce enough current gain. The voice quality of this circuit will not be as much as a conventional microphone but quite reasonable quality can be obtained. To set up the circuit, keep the preset R2 at around 10 Ohms and connect the battery. Now adjust R2 to obtain the optimum sound quality. Power the circuit from a 9 V PP3 battery. A 3 inch speaker can be used as K1. All capacitors must be rated at least 15V. An 8 Ohm speaker or head phone can be connected at the output to hear the picked sound. Hai sir. I am Samarth studying in diploma. I need important applications of this speaker to microphone converter circuit. Plz send me. hi,I’m guerizon.this cicuit is very interesting,but i want to know if it really works,please? i would like to find out how i can connect a mic to this circuit. my son has a walkie talkie and is is using the same principle. using the speacker as a mic. but i would like to know, if there is a way i can connect a mic to better the sound. sir, how input device is going to act output device? Hello sir..im ashok presently im studing diploma .i want to create microphone .please tell me information sir . Hello sir.. i need explanation on the speaker to microphone converter circuit. What is the function for the used resistor, transistor and capacitor. Why that value of ohm used for the resistors. Please help me sir. i am going to make this one. Hello Sir , I am Prashu, presently i am pursuing B.Tech .I want to take up a project in Communication and i am confused a lot . In this Project we have to design a circuit model too and show some functioning . Please suggest a good one. Hi Anusha you can try “useful domestic projects”. like LED emergency light, mains operated LED light, transistor intercom for your door phone. automatic night light (modified light activated switch), water level indicator etc. these projects will give you satisfaction, as well will be useful gadget at home.